LMCA operates an olympic size outdoor ice rink – set up with lines, 2 goals, high netting, full floodlights that can be accessed 7 am – 9 am, 4 pm – 11 pm daily. Rink has an attached warm up area with wood stove, benches and 2 heated change rooms – firewood is provided outside of the rink. An outhouse is available next to the rink. The rink is cared for, cleared, and prepared with our Zamboni on a regular base throughout the week. Service depends on snowfall and temperatures. While we are proud of our new Zamboni and will provide the best service possible, we are dependent on staff availability and weather. Thank you to the folks who have taken our training and will volunteer for ice rink maintenance! Snow shovels are available in the warm-up/bench area if we can’t get to it in time. Drop in is possible at any time until 11:30 pm. Other than the occasional rink rental, it is operated on a shared basis – anyone can come and enjoy it during operating hours. Please be considerate towards all our users – and clean up warm up room after yourself!! And remember – this is a public place- alcohol consumption in warm up area is not allowed. The rink belongs to the whole community, we will share it with all and treat other users with respect. We will take the time to leave the warm up shed and change rooms cleaner than when we arrived (there are brooms and dust pans in the change room). If we use firewood we will refill the supply beside the stove for the next people. We will be kind to the Zamboni and we move snow off the ice, it will all go OVER the boards and there will NOT be a pile left front of the gates or against the boards. We will use the outhouses, and not make puddles in the snow for the kids to find. At the end of our skate we will clear the ice of all items, including pucks and nets, so they do not melt into the ice or jam up the Zamboni. We respect that the oil furnace and rink lights turn off at 11 pm. We will remember to turn the switches off if we loose the lights. We will keep the change room doors closed to keep the heat in. We respect how important the safety glass is and will not intentionally shoot pucks against the glass. We will pay the daily fee or join the centre as members. All our guests will pay the $5 fee to help keep the rink going. If we see something that is not right we will communicate with each other to make things right. LMCA has to cover 75% of all maintenance cost – so we do rely on your fees! LMCA yearly membership includes use of ice rink for the full season. ($40.00 per year for the whole family) forms are available in the warm up area or HERE pay cheque, cash or e-transfer. Non members please pay $5.00 day use fee in drop box provided at rink entrance. Members please encourage your friends/guests to pay drop in fee! Not Exclusive. If you are planning a group event, shinny hockey or a skate with friends we will post a note in the rink for you. This will allow others to plan around your game or gathering. The ice still must be shared because, once again, this is not an exclusive rental. Above fees apply. Does not include main hall. Renting the ice rink exclusively for a special event is possible! Three hour rental $150.00. 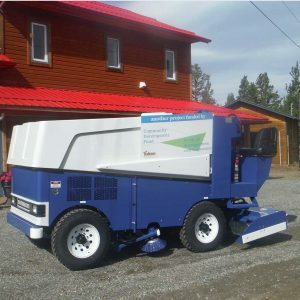 Includes Zamboni service before you arrive so you can start with a fresh sheet of ice. This includes up to 2 ice resurfacing during your time slot and at end. Membership mandatory for responsible party. Youth drop in hockey will start the end of November. Included in LMCA membership or Daily Guest Fee $5/person. Got any old hockey sticks kicking around in the corners? Donate them to LMCA for shinny hockey play.